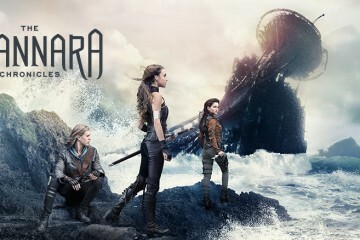 This week’s recap will focus on Episode 5 and 6 of The Shannara Chronicles which aired Tuesday, January 26th, 2016 and February 2nd, 2016 respectively. Warning: Expect massive spoilers. So, where did we leave off since the last episode? Amberle passed the test created by Elcrys, so she and Wil set off on their journey amongst elven guards with Eretrea in tow. Cephelo spots them in the forest and begins to follow them in order to save Eretrea. Just kidding, he really wants those elf stones. And that demon that Allanon killed that episode? It’s not so dead – and will continue its work for the Dagda Mor. Episode 4 opens to Lorin and Amberle running around the Elcrys ten years ago (by the way, she is cuter than ever). As she touches the tree, it begins to speak to her but the children are discovered within the chambers and taken to the King. The scene cuts to show Prince Ander and Commander Tilton doing the dirty outside the castle. As they enter a secret passage to return back to the castle unnoticed, someone follows them in. We return back to Amberle as she is being scolded by her father, King Aine. The king is shown encouraging Amberle as well, telling her to be tough and that she is stronger than all the other boys (insert tears please????). They are interrupted as the castle is under attack by gnomes. Aine steps in to try and work things out with the gnomes, but instead they stab the King twice, killing him in front of Amberle. We jump back to the present where Amberle and her group continue their quest as tensions rise. Cephelo catches up to them and once again, promises Eretrea her freedom, taking Amberle with them back to the camp and leaving the men to fend for themselves in the forest. The Dagda Mor is upset with the Changeling as it let Amberle escape and it must now return to the castle to find her. Prince Arion finds a village destroyed and takes the severed heads back to his father, King Eventine. He states that more must be done to fight the demons; they are raiding villages, and slaughtering populations – they must be stopped. Instead, King Eventine instructs that defending the Elcrys is their top priority, and Arion is not pleased by this decision. Meanwhile, Bandon and Allanon work on controlling Bandon’s powers. He must learn to control them in order to contact Amberle through the Elcrys. When Bandon places his hand on the Elcrys, he receives a message from Dagda Mor when he finds Amberle’s corpse. He states that Bandon and the gang will not be able to save Amberle, as her death is sealed. Amberle promises Eretrea that were she to help Amberle, then King Eventine would pay her twenty times what Cephelo promises. Cephelo brings Amberle into his tent with the intentions of sexual assaulting her but Eretrea saves the day and they go back to find the elf men with Cephelo as hostage. The girls find them in the forest about to be eaten, but Eretrea saves the day again. They end up reaching the grounds, but Amberle notices there are no guards around. As Crispen, leader of the elvian army, blows the victory horn to announce their arrival, the heads of (what is presumed to be) the guards are thrown over the walls as a demon emerges from the door. Cephelo hatches a plan to save them, resulting in an explosion killing the demon. Back at the castle, Prince Ander hatches a plan with the gnome who murdered his brother at the beginning of the episode, to help him and Commander Tilton find the demon army. Prince Arion enters his father’s chambers to discuss the rising tension between them. Angry that his father won’t give him the throne, he stabs his father in the stomach, killing him. But fret not for it was not actually the prince but the Changeling – who now sits on the throne impersonating the King. Episode six opens in Amberle’s dream of her and Wil having a romantic date in the forest that ends in them having a hot makeout session. However, the Dagda Mor appears in her dream frightening Amberle out of her sleep. The Changeling as King Eventine informs his son, Prince Arion, that Allanon has been lying to them and that Arion must find the sword hidden beneath Arborlon. This sword was created by the Druids specifically to kill the Dagda Mor. Arion promises his (fake) father that he will find it. As he searches for it, Arion finds Catania as she is attacked by Allanon, who, through Bandon, was controlled with the Dagda Mor’s spirit. Arion informs Catania that Allanon is not to be trusted and that together, they must find the sword. Naturally, Catania is aware of a mysterious area beneath the castle in the dungeons that could hold the sword, that Arion for some reason, is unaware of. Prince Ander and Commander Tilton move on in their quest to find the demon army along with the gnome, Slanter. The trio come across a group of murdered gnomes, Ander allows Slanter time to grieve over his people. Slanter uses this as an opportunity to escape. 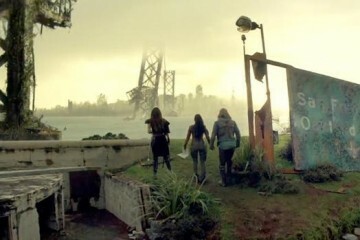 The demon that Wil and Cephelo killed obviously rises from the dead and heads for the direction of Amberle and the gang. As they look for another route to the Bloodfire, Cephelo states that the Pykon entrance would lead them back to the grounds. Crispen tells Cephelo that the Pykon is a fairytale, to which Cephelo insists it exists as his parents were murdered there. They find the fortress of Pykon hidden within the mountain side and enter it. A young girl meets them at the door and brings them to the owner and caretaker of the castle, a (creepy) elf named Remo who invites them to stay the night. The most fan-service scene comes into play as Eretrea enters a bath with Amberle, confirming that it ain’t just men she gets in bed with (WINK WINK). Wil and the rest of the team discuss if they can actually trust Remo, who invites them to the table for a meal while Wil takes watch. The young girl, Mag, comes to bring Wil food and he notices that she has the same ears as he does, implying the girl’s mother is human too. Wil and the others begin to realize that Remo has put something in their meals. The rest of the group wakes up hanging from the ceiling, their hands bound by ropes whereas Wil wakes up in Mag’s room. Amberle tries to reason with Remo, announcing that she is the princess and the kingdom will pay him for their safety. Instead, Remo takes her to a different room and begins to torture her with a contraption straight out of a Saw movie. Meanwhile at the castle, Allanon tries to plead his case to the fake king stating he does not understand how the Dagda Mor was able to enter Bandon. Prince Arion comes in, sword at hand, telling the king how Allanon attacked Catania. The fake king begins to belittle Allanon and encouraging Arion to fight him – making Allanon realize that the king is actually the Changeling. However, he realizes too late and Arion stabs the druid in the chest. Allanon’s body disappears, his fate unknown. Outside the castle, Slanter returns to Prince Ander and Commander Tilton as he found the demon army and realizes the realm needs the help of the elves. As Remo begins to torture Amberle, he explains how the elves killed his wife and Amberle begins to understand that things aren’t what she perceived them to be. Before Remo can go any further with torturing her, Wil comes in to save her with the help of Mag, who knocks her father out. They begin to exit the castle when Remo comes in, shoots his arrow only to kill his daughter before he dies. This is the least of their worries as the demon they previously thought was dead finds them (Cephelo yells “You gotta be kidding me!”… Same Cephelo, same). Cephelo and Eretrea make it across the canyon before he decides he’s going to cut the rope, leaving Wil and Amberle behind. Eretrea goes back for them and as they almost make it to the other side but the demon clings on to the rope. Cephelo cuts it in order to save himself, causing the trio and the demon to fall into the canyon. Verdict? A lot of stuff happened these two episodes that delved deeper into the history of the elves. It appears that most of the other inhabitants of the realm are unhappy with the kingdom, not just the rovers. Remo is a perfect example of the evils that were committed by the elves. I had a big problem with these two episodes as the style felt very different from one another, one an emotional story of daughter and father and the other a horror film. I was also bothered by the incessant need to throw the love triangle of Eretrea, Wil and Amberle in our faces, which increased this episode. But besides this, I am really loving the growth of the characters and the girl power that is forming between Eretrea and Amberle (and maybe love? ).